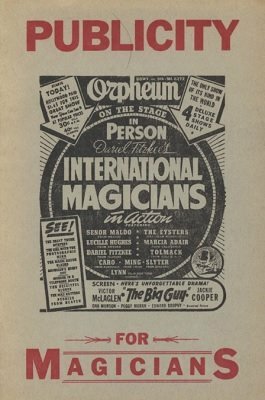 Few people are more fitted to discuss publicity for magicians than Robert Bernhard. I say this not because as a publicity man he has brought fame and fortune to waitresses and elevator girls who are now movie stars or because he has been my good friend for many years, but because he himself was a magician and knows the peculiar problems of the profession. Under pressure, he is usually willing to admit he was probably the worst performer to ever inflict himself on a long suffering yet patient and forgiving public. Nevertheless, for several years he managed to keep a few steps ahead of his fellow conjurers in the happy pursuit of theatre managers' and night club owners' checks. He has played dates from New Hampshire to Louisiana and from Bermuda to California while most magicians were bewailing the death of magic. And some of those dates turned out to be engagements! Of course, there was a trick to it. He was successful because he fooled people - perhaps not with his tricks but certainly with his publicity. Before an audience saw him perform it had already heard so much about him that it was sure he was sensational even before he took his opening bow. Theatre owners were similarly impressed. Whether they remained impressed after they saw him flub through his act is another matter. That, however, was of secondary importance. The thing to be remembered was that his ability to publicize himself secured him engagements and sold tickets to his show. II. What Will Publicity Do For You? 1st digital edition 2016, 38 pages.